Wow ladies, I was pleasantly surprised when I did a survey a few weeks ago asking you all what type of recipes you wanted and the majority of you wanted healthy vegan/vegetarian dinner recipes! I can totally relate to feeling stuck when it comes to making healthy dinners, especially when coming back from work or after having a long day being with the kids. It's not the best time to feel inspired to cook something new, I get it. Been there, wore the hat. So I can totally understand why most of you are looking for help in this department. I was in Abu Dhabi a few weeks ago spending time with my parents, sister and nieces and let me tell you, it was amazing not having to cook anything under pressure (when my boys get hungry, they have a way of making you question the meaning of life) and just totally binge on authentic Sudanese food (that's where we're originally from). Don't ask me how many times I've eaten moussaka. Just don't. So obviously when I got back to London, I was very pregnant, very homesick and didn't wanna cook for nobody. All I could think about was eating my mum's food. I cried for a couple of days (mostly for the moussaka) and then I decided I needed to get my act together and inspire myself again. As Sudan is in North Africa, a lot of our cuisine has a lot of Arabic/Middle Eastern influence (as well as East African). This dish is a vegan version of what we would call Mahshi (meaning stuffed). It's a popular dish in Sudan as well as Egypt, and is usually vegetables (such as tomatoes, courgettes, cabbage or bell peppers) stuffed with minced beef or lamb, tomatoes, onions, rice and your typical middle eastern spices. 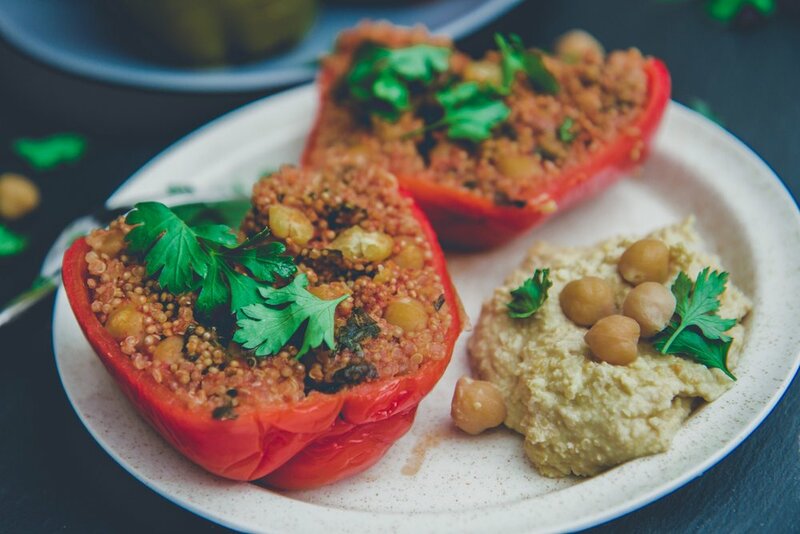 I thought it would be fun to make Middle Eastern stuffed bell peppers vegan and waaay less complicated (think about how long it would take you to core a tomato or courgette vs a bell pepper), so bell peppers it was! I love this recipe. So much. For so many reasons. This stuffed bell peppers recipe is one of those vegan recipes that is really tasty and really filling. It's just so warming, especially now that it's getting colder here in London (if you're looking for more winter recipes why not try my green lentils and coconut curry recipe here). And really it cooks itself, all you have to do is mix a bunch of ingredients, in one bowl, stuff the peppers with them and then shove them all into the oven. Yes it takes like 50 mins to cook in the oven, but that's IDLE TIME. You're not fussing over the stove, you can chill, spend time with your family, or do whatever the heck you want to! Not much washing up afterwards either. Still goes down as a hack in my books. And just because it's vegan doesn't mean it's lacking protein. The quinoa and chickpeas pack a punch in the protein department as well as complex carbohydrates and fibre. The bell peppers are an excellent source of vitamin C, making this recipe a well rounded stand alone meal in itself. Pair it with some homemade hummus or coconut yoghurt and lime, and duuude. Life is good. Works well for next day lunch too, aaand dinner for the rest of the week. And when you do make these awesome stuffed bell peppers, share them on Instagram using #EarthNSpoon (and don't forget to tag @earthandspoon) so we can share a virtual Hi5. Finely chop 2/3rd of the parsley and set the rest aside. Cut off the tops of the bell peppers and remove the 'ribs' and seeds. Keep the tops and set aside. In a mixing bowl, add in the chopped parsley, quinoa, passata, chickpeas, garlic, avocado oil, salt, ground coriander, paprika and cumin and mix together. Place the peppers onto the baking dish with the tops facing upwards, and pour (3/4 cup) of water onto the dish then cover with foil. Cook in the oven for 50 mins. Serve hot with hummus or coconut yoghurt. Add the rest of the parsley for garnishing. * If you have any mixture leftover you can always add some water to it and cook it over the hob the next day for lunch. Bell peppers - are an incredible source of Vitamin C. Just 92g or 1 cup of raw bell peppers have 157% of your daily recommended intake of Vitamin C! Vitamin C is a powerful antioxidant and helps to strengthen your immune system. Quinoa - a gluten free seed, also one of the rare plant based sources that provides all 20 amino acids and 10 essential acids that our bodies can't produce. This is why it is considered a complete protein. 1 cup of cooked quinoa provides around 17% of a female's protein daily value. Tomatoes - contains powerful antioxidants and lycopene which studies have shown to slow down tumour growth. They are also a good source of Vitamins A & C.
Chickpeas - are a great source of fibre, which helps control blood sugar levels. They are also an excellent source of manganese and folate (Vitamin B6). Chickpeas are also a good source of plant based protein. Garlic - linked with preventing cancer, heart disease, strokes and a multitude of infections. It also helps improve dementia symptoms, and controls blood pressure. Avocado oil - is a great oil to use for cooking as it has a high smoking point, so it is not likely to oxidise which is linked to cancer causing free radicals. It is high in monounsaturated healthy fat and Vitamin E which is great for your skin! Coriander - protects against the risk of food poisoning as well as decreases blood pressure, cholesterol (the bad kind) and blood sugar levels. It also helps improve IBS symptoms by improving digestion as well as regulate menstrual cycles and ease the bloating and cramps associated with them. Cumin - contains vitamins A & C, which help to reduce the risk of cancer. Also contains phosphorus which helps detox the kidneys, as well as a high source of calcium and iron needed for bone health and treating anaemia. Cumin is also an antiviral. Parsley - just 1 cup of parsley contains Vitamin K 1230% DV, Vitamin A 101% DV and Vitamin C 133% DV! It is also packed with cancer fighting flavonoids and antioxidants. Sea salt - helps to balance body fluids and restores electrolytes. It is also a rich source of trace minerals.